If you need more info or a sample of any of these products, click the Contact Us link and send us an email. TH Hilson Now Offers High Quality Steel Pails – Call to Learn More! Looking for a self-crosslinking styrenated acrylic emulsion offering excellent gloss development, corrosion and chemical resistance as well as early water resistance and rapid hardness development? EPS 2507 is the answer! An emulsion containing 2% Repulpami improves the skin by reducing the appearance of wrinkles and fine lines, by lifting and plumping it, and also by firming and hydrating it. ex T is Zero VOC, Virtually No Odor & Multifunctional. 100% Natural Preservative with tested efficacy. EPS 2533 is a styrenated acrylic emulsion that offers outstanding ink and tannin stain blocking and excellent adhesion. It is ideal for use as a universal primer or low gloss topcoat on ferrous & non-ferrous metal, cementitious, wood and plastic substrates. EPS 2293 is a self-crosslinking all-acrylic emulsion that gives superior performance in clear concrete sealers, porch and floor paints, garage floor paints and concrete stains. Looking For a Food Grade Antifoam? BlueStar Silicones Silcolapse 700 antifoam series are used in a wide range of indirect food contact applications. 100% natural purified extract of pomegranate in glycerin. Stimulates expression of aquaporines in epidermis, proteins essential to circulation of water in skin. Optimizes water circulation throughout skin to restore water homeostasis. Decreases collagenase synthesis and increases collagen. 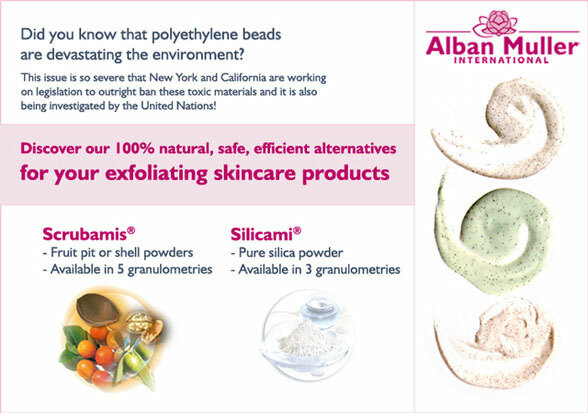 5-10 times higher concentration in active molecules than typical market extracts due to Alban Muller’s eco-responsible and exclusive manufacturing process. Made to pharmaceutical standards, at constant and reproducible concentration, verified by HPLC. Identification of 90% of phytochemical composition. Plants are sourced locally for qualilty and traceability. Extracts are supplied in glycerin and contain no glycols or preservatives. All these advantages at a competitive price and with a 21 day lead time! Red + Green. Blue + Orange. Yellow + Purple. Color Correction Concepts for Skin. Discoloration on the face has an undertone to it. Undereye circles are blue/gray, blemishes are pink, hyperpigmentation is brown. You can cancel out the unwanted color by adding an effect pigment to your formula in a complementary color, i.e. the color opposite on the color wheel. Need to hide under eye circles? Try Optique Satin Red and Optique Satin Gold. Need to warm up a gray skin tone? Try Bichroma Magenta. 3V has an optical brightener to match your detergent formulation and performance requirements. Alphabet Creams: Learning Your BB, CC and DD’s? TH Hilson has what you need! What It Does: Offers daily sun protection, extra hydration, and a touch more coverage than a tinted moisturizer. What It Does: Imparts light veil of coverage, gives immediate color correction and has sunscreen for UV protection. What it Does: A BB and CC cream combined. Evens out skin tone, gives skin barrier protection to prevent moisture loss, and has UV protection. Typically contains anti-aging ingredients for additional benefits. TH Hilson has ingredients for your alphabet cream! Try our wide range of glitters for your coating or craft application! Polygel CB: Low viscosity rheology modifier for thickening, suspending & stabilising detergency applications. Polygel DR: Hydrophobically modified and cross-linked for synergistic thickening of surfactants. Polygel W301: 30% dispersion in water for easy addition during any step of production. Consumers are clamoring for “safe” or “chemical-free” sunscreens based on mineral UV filters. Yet they are also demanding broad spectrum protection, good application aesthetics, and lack of chalkiness on the skin. G-Block Series from Applechem Delivers! NACURE XC-305 Catalyst for Lower Temperature Cure of Coil & Metal Decorating CoatingsNACURE XC-305 is a novel catalyst that can reduce the cure temperature of solventborne amino crosslinked coatings. Applications include coil coatings, extrusion coatings, metal decorating & applicance finishes. Adds gloss when used as a surface-polishing agent in the tumbling process to produce sugar coated candies or pharmaceutical tablets. Adds gloss to fruit and vegetable coatings. Dover introduces patent-pending Doverlube LCS-10 light colored sulphurised ester. Excellent stability in various naphthenic oils as well as Group I, II & III paraffinic oils. Performance testing shows Doverlube LCS-10 performs better than or on par with other sulphurised additives, even additives containing up to 40% sulphur content. Free of animal fats & oils; contains no inhibitors. Eastman Introducing Synergex LA Lipophilic Amine at Next Week’s STLE! Surtech Antifoams Outperform the Competition! In a Quick Break Foam Test, Surtech HA-4700 & HA-4720 defoamers outperformed Munzing HP 720. Surtech KE-131 is a universal defoamer for soluble oils, low oil & high oil semi-synthetics, full synthetics & tankside. Or, use Surtech KE-802 pre-diluted version of KE-131 as an easy-to-use tankside defoamer. Color Matters. Color Effects Dramatize! MicroPowders Introduces Four New Products! MICROSPERSION 31AQ-50 is a 50% wax solids waterborne dispersion of AquaMatte 31. This product was developed for those who prefer highly efficient micronized waxes in an easy to use liquid form. In addition to its matting efficiency, Microspersion 31AQ-50 imparts a smooth surface with marked improvements in burnish and mar resistance when compared to inorganic matting agents. Applications include architectural wall and trim paints, wood varnishes as well as general industrial waterborne finishes. AQUAMATTE 22 is a finer particle size version of AquaMatte 31. AquaMatte 22 has a mean particle size of 6.0-8.0 microns with a maximum size of 22.0 microns. This product imparts a smooth surface feel in satin and semi-gloss varnishes with the added benefit of reduced haze. This product was initially developed for waterborne wood finishes. MICROKLEAR 709 is a homogeneous melt blend of polyethylene, PTFE and carnauba wax. MicroKlear 709 gives the formulator all the performance advantages of the MicroKlear waxes with the addition of PTFE for added heat resistance and lubricity. This product is ideal for UV varnishes, fastener coatings with torque tension requirements and can coatings. MICROPRO 700 is a melt blend of a modified polypropylene and PTFE.